If you're one of the many American progressives cheering on the performance of your new political rock star, Alexandria Ocasio-Cortez, look around: Many of the people cheering with you are Republicans. Ocasio-Cortez's 14-point victory over 10-term incumbent Democrat Joe Crowley was certainly impressive. Her performance since then? Not so much. The GOP have branded her a gaffe machine, Democrats on Capitol Hill her urging her "to do things differently," and her stumbling media appearances have sparked references to the "P" word: "Palin." There's a lot to like about the bold, outspoken battler from the Bronx who, until just a few months ago was still tending bar. 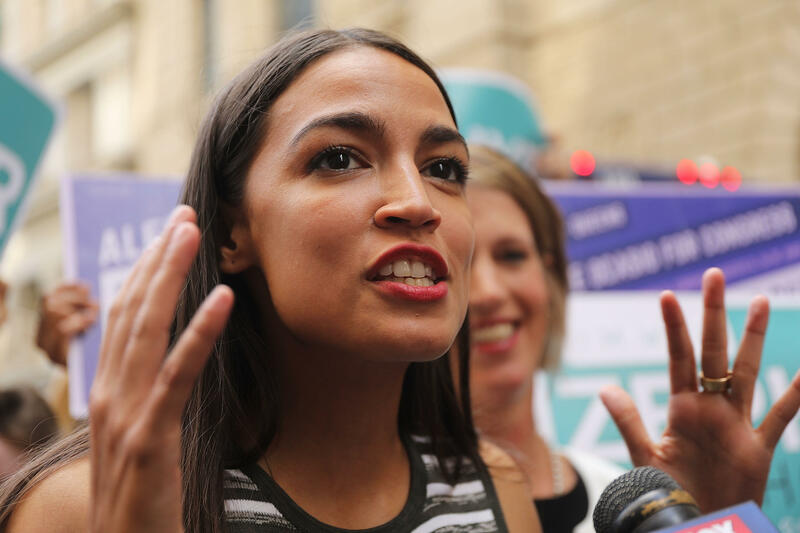 She's enthusiastic, she's attractive, she has a degree in economics from Boston University, and she's unapologetic in her (self-described) socialist views. Unfortunately, Ocasio-Cortez doesn't appear to have test-driven her campus socialism in the real world. And as a result, her media performances under even the most tepid of questioning have been less than productive. Claimed "unemployment is low because everyone has two jobs." Claimed the "upper-middle class doesn't exist anymore." Wrongly accused her defeated Democratic opponent of plotting a third-party challenge against her. "Americans have the sticker shock of healthcare as it is, and what we're also not talking about is why aren't we incorporating the cost of all the funeral expenses of those who died because they can't afford access to healthcare? That is part of the cost of our system." Yes — what about all the savings we'll have under #MedicareForAll once people stop dying? After one of Ocasio-Cortez's recent unforced errors, establishment D.C. moderate Norm Ornstein tweeted that she is "not ready for prime time." Ocasio-Cortez's gaffes have become so frequent — and harmful — that a cottage industry has risen up on the Right to trumpet them. She's become a staple of talk radio and clips of her less-than-flattering moments frequent Fox News. Websites like the Washington Free Beacon and the Daily Caller delight in highlighting the latest misstep from the new poster person for American Progressivism. Republicans would love nothing more than for Democrats to spend the 2018 midterm campaign defending socialist policies. Candidates who promote policies like single-payer health care, or free college tuition or government-guaranteed jobs for all know they're going to face the Margaret Thatcher question eventually: How do you pay for it? Thatcher's famous observation was that "the trouble with socialism is that eventually you run out of other people's money." Many Americans perceive themselves as the "other people" in that scenario and so they want to know how much all this "free" stuff is going to cost. And this is the Ocasio-Cortez Effect: Americans are suspicious of the idea of socialism (though they are fine with "socialist" policies like welfare and Medicare), and typical voters tend to dismiss its advocates as naïve. The error-filled answers and shaky logic offered by Ocasio-Cortez confirm the assumption that, however compassionate these progressive programs are, they have no idea how to pay for them. The fact that Ocasio-Cortez still doesn't have a coherent answer when asked how she'll pay for all the new spending she wants reflects poorly on her — but is even more damaging to her socialist ideals. This may be one reason her influence among Democratic voters already appears to be waning. Last month, she and her progressive mentor Bernie Sanders campaigned hard for progressives Cori Bush and Brent Welder in the Kansas Democratic primary. Both lost. In a Politico article entitled "Down Goes Socialism," Bill Scher notes that it was Hillary Clinton, and not Ocasio-Cortez, whose endorsement carried the most weight in Michigan last week. "Clinton's late robocall in support of Haley Stevens helped take Stevens from second place in polls to an election night victory in the suburban 11th District, a top Democratic target, while Fayrouz Saad, backed by Ocasio-Cortez, placed fourth." In fact, Democratic establishment candidates have been on a roll since the Ocasio-Cortez upset. Could it be that her high-profile missteps are convincing candidates to remain more moderate? That the net result of Ocasio-Cortez's candidacy is fewer progressive candidates in November? It could be the case that Ocasio-Cortez's vision of the Democratic Party as a bastion of European-style socialism is their inevitable future. Or it could be, as her fellow Democrat Sen. Tammy Duckworth of Wisconsin quipped: "Yes, it's the future of the Democratic Party — in the Bronx." But if democratic socialism prevails in the short-term, it will be despite — not because of — the Ocasio-Cortez Effect.